at securing quality guests, while maximizing the value of the owners assets. We know that condo owners purchased with either an investment strategy or a desire to have a second home that could potentially make some money. 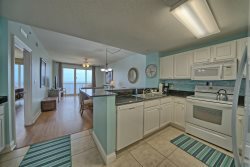 We appreciate and understand that and the unique challenges that exist with vacation rentals in a beach environment. That is why we focus our energy on providing professional management services at an affordable price. Many of our current owners signed contracts with us because of the rising and hidden costs of some of our competitors. We also receive positive feedback regarding the quality and prompt manner of each level of communication and reporting. We have three goals in managing your vacation property: protect your property, maximize your annual revenue, and provide outstanding customer service so that guests will want to return year after year. How do we do it? We are constantly working with industry professionals in housekeeping and maintenance to protect your property by keeping it clean and well maintained. Guests quickly realize that we provide not only a quality vacation rental but personal, attentive customer service. We maximize your revenue by offering competitive rates and innovative "specials". We also offer detailed monthly accounting of revenue, commission and expenses; timely owner payouts, copies of maintenance invoices without markup and accurate 1099s and annual reports at tax time. Complete income and expense reports for each property. Maximum web exposure on the 24 most popular search engines. Condos are posted on multiple marketing sites. Interior pictures of each condo are posted to our website. 20% Management fee on vacation rentals. systems, and rotation systems that often leave owners wondering why their condo is sitting empty. rented! Please take a look at the next few pages to get an idea of how we promote our condos! team can serve you. If you have any questions, please give me a call. It isn't our goal to be the biggest management company on the beach - just one of the best!